Wonderful four bedroom/three bath home on a beautiful wide lot that backs up to Terrace Green Park. 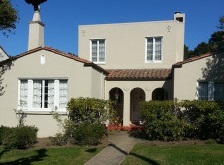 The charming Spanish style home was built in 1921. It has spacious rooms, a wood burning fireplace and excellent development potential. The well located house has been in the same family for more than 50 years, it has been well cared for and will offer its next owner an excellent opportunity to make it their own.